The Marriage of Figaro: Act 3, "Crudel! Perchè finora farmi languir cosi?" The Marriage of Figaro: Act 3, "Hai già vinta la causa!... 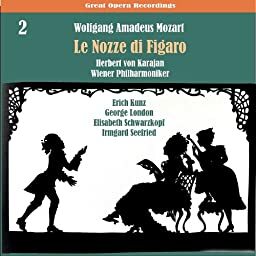 Vedro, mentr'io sospiro"
The Marriage of Figaro: Act 3, "Riconosci in quest'amplesso"
The Marriage of Figaro: Act 3, "E Susanna non vien?... Dove sono"
The Marriage of Figaro: Act 3, "Sull'aria..."
The Marriage of Figaro: Act 3, "Ricevete, o padroncina"
The Marriage of Figaro: Act 3, "Ecco la marcia!.... Amanti! costanti!" The Marriage of Figaro: Act 4, "L'ho perduta, me meschina!" The Marriage of Figaro: Act 4, "Tutto è disosto... Aprite un po'quegl'occhi"
The Marriage of Figaro: Act 4, "Giunse alfin il momento... Deh, vieni, non tardar"
The Marriage of Figaro: Act 4, "Piano, pianin, le andrò piùpresso"
The Marriage of Figaro: Act 4, "Tutto è tranquillo e placido"
The Marriage of Figaro: Act 4, "Pace, pace, mio dolce tesoro"
The Marriage of Figaro: Act 4, "Gente, gente, all'armi, all'armi"